When replacing a swimming pool motor you should always replace all seals and gaskets. Most motors will fail as a result of seal failure, not manufacturing defects. proper installation of the seal will hel ensure longer life of a motor. Most seals will consist of two parts, the ceramic portion and the spring portion. hence the name mechanical seal. They must mate properly for preventing the water from getting to the motor. 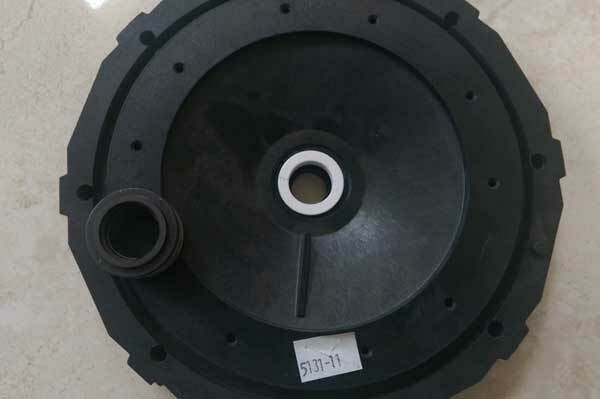 In most cases, the ceramic portion of the seal is placed into the motor mounting plate, the sprng portion of the seal is placed on the shaft with the raised ridge facing the white ceramic portion of the seal. Motor Mounting Plate with White ceramic installed. The white ceramic portion of the seal must be pushed in firmly into the plate, it is important not to touch the seal with you hand. Use a paper towel or clean cloth. If possible place the seal into the motor mounting plate prior to bolting the plate to the motor, this will allow you to inspect how the seal is position in the mounting plate, by looking at the opposite site of the plate where the seal is mounted. It should be pushed firmly in, and not skewed in any way. In the above picture note the mechanical portion of the seal (left edge of the mounting plate), it is pictured with the ridge up for illustraion purposes, but when installed should be facing the white ceramic. After mounting the plate to the motor side the mechanical portion of the seal, the seal should fit sngly on the motor shaft, if it does not you might have the weong seal.